The Amargosa River is an intermittent waterway, 185 miles (298 km) long, in southern Nevada and eastern California in the United States. 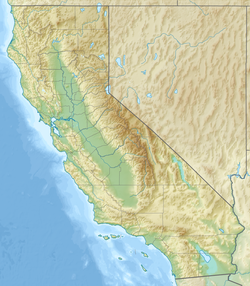 It drains a high desert region, the Amargosa Valley in the Amargosa Desert northwest of Las Vegas, into the Mojave Desert, and finally into Death Valley where it disappears into the ground aquifer. Except for a small portion of its route in the Amargosa Canyon in California and a small portion at Beatty, Nevada, the river flows above ground only after a rare rainstorm washes the region. A 26-mile (42 km) stretch of the river between Shoshone and Dumont Dunes is protected as a National Wild and Scenic River. At the south end of Tecopa Valley the Amargosa River Natural Area protects the habitat. Except during flash floods that occur after cloudbursts, most of the course of the Amargosa River is dry on the surface. The flow is generally underground except for stretches near Beatty and near Tecopa, California, in the Amargosa Canyon. In the canyon, the river passes through the Amargosa River Natural Area, a region of dense greenery and prolific wildlife made possible by the presence of water. The river arises at about 3,900 feet (1,200 m) above sea level in Nye County, Nevada, along the southern side of Pahute Mesa in the Nellis Air Force Range. Thirsty Canyon Wash enters at the river's source, and when carrying water, the river flows from there southwest into Oasis Valley. Running parallel to U.S. Route 95 near the Bullfrog Hills to the west (right), the river receives Sober-Up Gulch from the right and then Beatty Wash from the left bank. Another 3 miles (5 km) or so downstream, the river flows through Beatty and turns south-southeast through the Amargosa Narrows into the Amargosa Desert. At this point, Bare Mountain lies to the left and the Grapevine and Funeral Mountains of the Amargosa Range lie to the right. Downstream of the Narrows, still flowing roughly parallel to Route 95, the river passes Big Dune, which is on the river's left. Shortly thereafter it passes the town of Amargosa Valley on the left, leaves Nevada, and enters Inyo County, California. In this stretch, it receives Forty Mile Wash from the left. Running roughly parallel to California Route 127, the river passes through Death Valley Junction. Shortly thereafter it receives Carson Slough, which drains Ash Meadows National Wildlife Refuge, from the left. Soon the river passes between the Resting Spring Range to the left and the Greenwater Range to the right before reaching Shoshone. Below Shoshone, the river continues roughly parallel to Route 127 to Tecopa. Downstream of Tecopa, with the Old Spanish Trail, it passes through the Amargosa Canyon between the Sperry Hills on the right and the Dumont Hills on the left, enters San Bernardino County, California, and flows by Dumont Dunes in the northern Mojave Desert. Turning west, the river crosses under Route 127 and enters Death Valley National Park between the south end of the Amargosa Range on the right and the Avawatz Mountains on the left. Turning northwest and then north, the river re-enters Inyo County, passing between the Owlshead Mountains on the left and the Ibex Hills on the right and receives Confidence Wash and Rhodes Wash, both from the right. In this stretch, the river runs roughly parallel to Harry Wade Road and, further north, to California Route 178 and West Side Road. The river receives Willow Creek from the right and ends in Badwater Basin, about 279 feet (85 m) below sea level, between the Black Mountains on the right and the Panamint Range on the left. Disappearing into the ground, it feeds the aquifer that is the remnant of prehistoric Lake Manly. The United States Geological Survey (USGS) monitors the flow of the Amargosa River at a gauge station near the Old Spanish Trail Road, 0.2 miles (0.3 km) west of Tecopa. The average flow of the river at this station is 3.80 cubic feet per second (0.11 m3/s). This is from a drainage area of 3,090 square miles (8,000 km2), much of which is noncontributing and all of which represents about 60 percent of the total Amargosa River drainage basin. The maximum flow recorded there was 10,600 cubic feet per second (300 m3/s) on August 16, 1983, and the minimum flow was 0 cubic feet per second (0 m3/s) on some days in some years. During very wet periods, the Amargosa River can flow at the surface in Death Valley National Park. The name of the river comes from the Spanish word, amargo, for "bitter", probably shortened from agua amargosa, "bitter water". The name was first recorded in 1844 and is believed to refer to the alkaline water. The river is an ancient stream, following an antecedent canyon. Evidence of human habitation along the river goes back more than 10,000 years. In addition to prehistoric Lake Manly in Death Valley, the middle river valley was submerged during the late Pleistocene by prehistoric Lake Tecopa. The canyon floor along the Amargosa Range has remnants of indigenous habitations that are protected by the Bureau of Land Management. The Old Spanish Trail followed the course of the river in the Amargosa Canyon, during the 19th century. From 1907 to 1941, the Tonopah and Tidewater Railroad followed the lower course of the river serving remote Death Valley communities. In March 2009, as part of the Eastern Sierra and Northern San Gabriel Wild Heritage Act, a 26-mile (42 km) stretch of the river between Shoshone and Dumont Dunes was protected as a Wild and Scenic River. ^ a b c "Amargosa River". Geographic Names Information System. United States Geological Survey. January 19, 1981. Retrieved February 23, 2009. ^ a b c "Water-data report 2007: 10251300 Amargosa River at Tecopa, CA" (PDF). United States Geological Survey. Retrieved February 24, 2009. ^ Tanko, Daron J.; Glancy, Patrick A. (2001). "Fact Sheet 036-01: Flooding in the Amargosa River Drainage Basin, February 23–24, 1998, Southern Nevada and Eastern California, including the Nevada Test Site". United States Geological Survey. Retrieved February 24, 2009. ^ Lingenfelter, Richard E. (1986). Death Valley & the Amargosa: A Land of Illusion. Berkeley and Los Angeles: University of California Press. ISBN 0-520-06356-2. ^ "Amargosa River Natural Area". Bureau of Land Management. 2007. Archived from the original on February 27, 2009. Retrieved March 2, 2009. ^ a b c d e f Nevada Road and Recreation Atlas (Map) (2007 ed.). Benchmark Maps. § 78, 82–83. ISBN 978-0-929591-95-7. ^ "USGS National Elevation Dataset (NED) 1 meter Downloadable Data Collection from The National Map 3D Elevation Program (3DEP) - National Geospatial Data Asset (NGDA) National Elevation Data Set (NED)". United States Geological Survey. September 21, 2015. Retrieved September 22, 2015. ^ "California's Groundwater Bulletin 118: Death Valley Groundwater Basin" (PDF). California Department of Water Resources. 2004. Archived from the original (PDF) on May 1, 2009. Retrieved March 1, 2009. ^ "Death Valley Geology Field Trip: Shoreline Butte". United States Geological Survey. 2004. Archived from the original on March 21, 2009. Retrieved March 1, 2009. ^ Gudde, Erwin; William Bright (2004). California Place Names (4th ed.). Berkeley: University of California Press. p. 11. ISBN 0-520-24217-3. ^ Bright, William; Erwin Gustav Gudde (November 30, 1998). 1500 California Place Names: Their Origin and Meaning. Berkeley: University of California Press. p. 15. ISBN 978-0-520-21271-8. Retrieved January 20, 2012. ^ a b c d "Amargosa River: A Unique Stream in the Mojave Desert". Friends of the River. Archived from the original on July 18, 2010. Retrieved October 25, 2009. Stoffer, Philip (January 14, 2004). "Changing Climates and Ancient Lakes" (.html). Desert Landforms and Surface Processes in the Mojave National Preserve and Vicinity. Open-File Report 2004-1007. USGS, US Department of the Interior. Archived from the original on October 23, 2009. Retrieved September 12, 2009. Stoffer, Philip (January 14, 2004). "The Mojave River and Associated Lakes" (.html). Desert Landforms and Surface Processes in the Mojave National Preserve and Vicinity. Open-File Report 2004-1007. USGS, US Department of the Interior. Retrieved September 12, 2009. Wikimedia Commons has media related to Amargosa River. This page was last edited on 15 November 2018, at 19:52 (UTC).